The Blue Ridge Parkway is more than a scenic drive. You could call the Parkway the country’s greatest hiking trail head. The Blue Ridge Parkway offers easy access to all kinds of hiking adventures, from short walks to day-long treks. 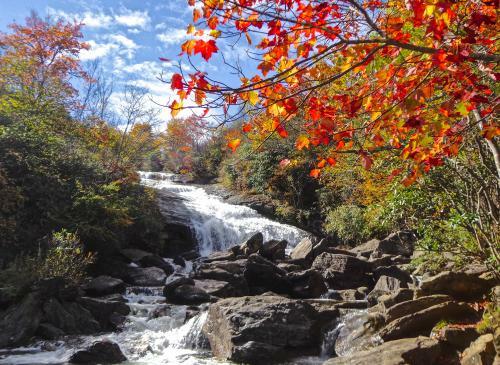 In the Asheville area, the Blue Ridge Parkway is your base camp for hiking to 6,000-foot mountaintops, exploring refreshing waterfalls or taking a leisurely stroll through a fragrant balsam forest. With so many hiking trails to choose from, we’ve narrowed it down to these top 10 Blue Ridge Parkway hikes within an hour of Asheville. This short hike leads to a big payoff with 360-degree, postcard perfect views at the summit. 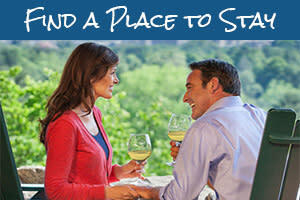 Craggy Pinnacle at Craggy Gardens is an iconic Asheville adventure that is relatively close to town. In addition to long-range views, you’ll see dramatic rock formations. And, this trail is one of the best places to see the stunning pink rhododendron blooms which typically appear in late May/early June. See our guide to the Craggy Pinnacle hike. Hike from the highest peak east of the Mississippi River (Mount Mitchell) to the second highest one, Mount Craig! On the ridge line of the Black Mountains, you’ll often find yourself above the clouds. The Deep Gap Trail is considered moderate-to-strenuous. For a quick, easier hike, take the paved and handicap accessible Summit Trail to the lookout platform on top of Mount Mitchell. See our guide to the Deep Gap Trail. Explore local history by taking a hike to Rattlesnake Lodge, the former summer home of Asheville physician and outdoor activist Dr. Chase Ambler. The lodge was destroyed by a fire in 1920, but some stone ruins remain. 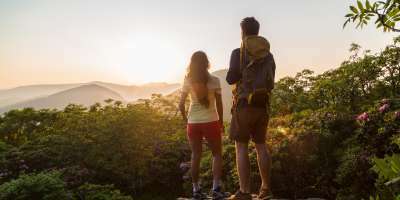 This moderate hike follows the Mountains-to-Sea Trail, which connects the Great Smoky Mountains to the North Carolina Outer Banks. See our guide to Rattlesnake Lodge. Just a couple miles from the trail head to Rattlesnake Lodge, you’ll find another popular hike on the Mountains-to-Sea Trail. 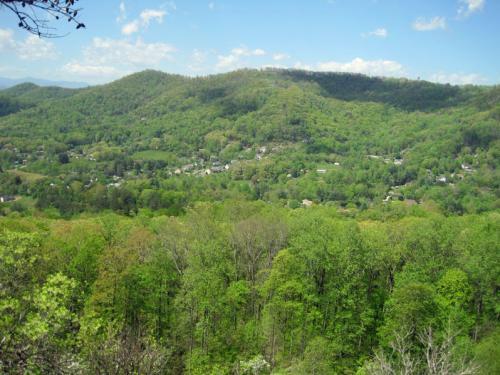 The Craven Gap hike is a good introduction to Asheville’s mountain scenery. It’s a relatively easy hike through the forest. And, it’s one of the only places a U.S. President has hiked on the Parkway. President and Mrs. Obama hiked here in 2010. See our guide to the Craven Gap hike. The Folk Art Center, the most visited attraction on the Blue Ridge Parkway, is your starting point for this Mountains-to-Sea Trail. The Lunch Rocks Trail takes you through the forest to a rock outcropping that overlooks the Haw Creek Valley. 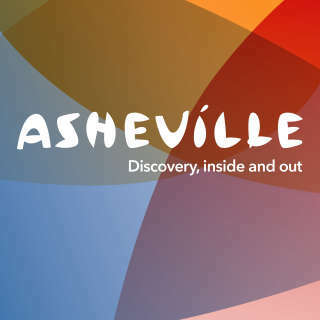 The trail head is just 15 minutes from downtown Asheville. See our guide to the Lunch Rocks Trail. While the name “Hard Times” sounds ominous, this hike is actually one of the easiest on the list. The gentle trail takes you through Bent Creek Experimental Forest and the North Carolina Arboretum, offering views of mountain ridges, Lake Powhatan and even a glimpse of Biltmore. See our guide to the Hard Times Loop trail. 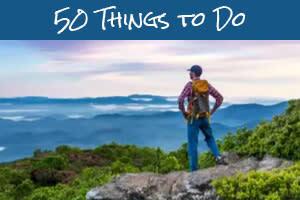 Hike to the top of Asheville’s most recognizable mountain! The 5,721-foot summit can easily be seen from downtown Asheville and is perfectly framed by the windows at Biltmore. When you reach the top, you’ll have a view of another well-known peak: Cold Mountain. This is a moderate-to-strenuous hike. Not far away on the Blue Ridge Parkway, is another area favorite trail: Frying Pan Tower. While the hike is shorter (1.5 miles round trip), Frying Pan is best for those who aren’t afraid of heights. See our guide to the Mount Pisgah trail. Graveyard Fields is family-friendly hike on the Blue Ridge Parkway that has something for everyone and offers several hiking options. The name comes from the appearance of the landscape after logging and fire altered the appearance of the forest. Our favorite loop hike here takes you to two waterfalls. In addition to waterfalls and beautiful scenery, Graveyard Fields is one of the first places near Asheville to see fall color each year. See our guide to Graveyard Fields. The unimpeded, long-range views from Black Balsam Knob make this hike a Blue Ridge Parkway classic. 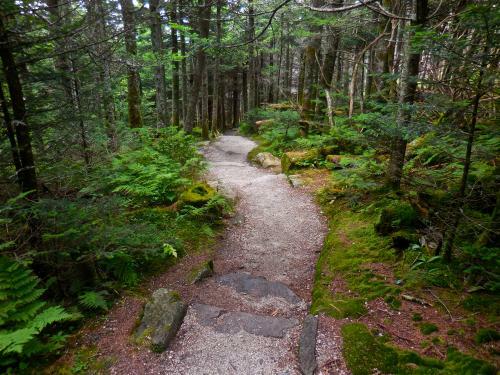 Hiking to Black Balsam on the Art Loeb Trail is a family-friendly experience that can be extended with an additional hike to Tennent Mountain. Close to Black Balsam is the less-traveled trail to Sam Knob, which offers incredible views. See our guide to Black Balsam. 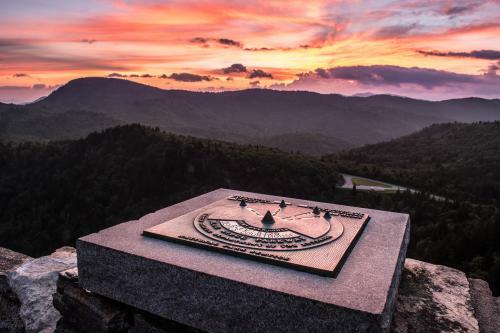 With views to the north, south and west of the summit, Devil’s Courthouse is worth the challenge. It’s just a half mile from the parking area to the top of this legendary rock outcropping. Much of the trail is paved but this short, steep climb will give you a good workout. See our guide to Devil’s Courthouse. Photo credits: Top photo by Jared Kay. Lunch Rocks photo by Danny Bernstein. Deep Gap Trail, Graveyard Fields and Devil&apos;s Courthouse photos by Jason Tarr.